Planned maintenance is essential for all lifts in order for them to realise their fullest lifecycle while remaining reliable and safe. Regular maintenance is also essential for the continuing safety of the lift, and its servicing personnel. There is also a legal duty on the lift owner/operator to ensure that minimum standards are met. The cost of rectifying problems as a result of lack of maintenance is invariably more expensive than the cost of a maintenance contract. Even an infrequently used lift still sustains continual loads and stresses on the vital areas such as suspension ropes and other components 24 hours a day. Our routine maintenance of your lift provides you with this and much more - it is a pro-active approach which is designed to foresee and prevent problems arriving. It increases the life of your lift by detecting problems and advising on the course of action prior to them becoming costly both in money and downtime. It increases the reliability of your lift by providing correct lubrication and carrying out minor adjustments to maintain the lift to its design parameters. It provides essential safety checks to ensure that there is no unsafe condition developing. 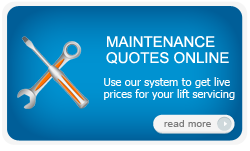 Our maintenance schedules are designed around your individual lift and the usage in your particular building. It is a pre-planned programme of checks - adjustment and lubrication, and can include the replacement of wearing parts before their serviceable life expires. 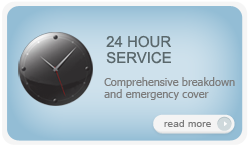 This provides routine monthly visits and 24-hour emergency call out service. The full cost of labour or parts is charged for separately. Visit frequency can be varied to suit the lift type and usage. Contact us for a detailed copy of our service agreement terms and conditions. 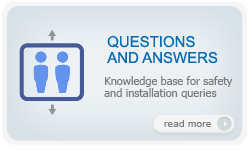 Click here to enter your lift information and get a real-time servce plan quotation.